It wasn’t a surprise but it was a disappointment. As I rode my bike on Saturday, fast, down 8th Street in Park Slope, a driver, coming up from behind me, thought she knew better than I where in the street I should be riding. She started – as happens very frequently when one rides down these streets, correctly, in the middle of the road - trying to honk me out of her way. 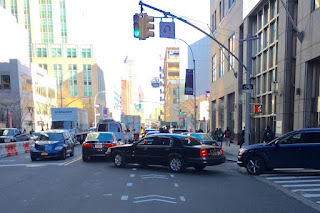 I’d ridden down 8th St because neighbouring, busier 9th St’s bike lane – sandwiched in the dangerous door zone for parked cars – is invariably clogged with double-parked cars. It’s far more dangerous and stressful than its narrower, one-way neighbours. car passing you at 30mph as you barreled down here? But, when she caught up with me at the next intersection, the woman explained why she thought she had the right to breeze past as if I weren’t there. “You shouldn’t be in the middle of the road,” the woman told me. “I was stopping you from overtaking me until I could let you past safely,” I said. “You don’t belong in the middle of the road,” she said. “Yes I do,” I answered. Then, inevitably, as I rode off, a bystander shouted after me. The exchange illustrated, in part, people’s automatic, infuriating assumption that they are clever and sophisticated and cyclists are uninformed simpletons making stupid decisions for unfathomable reasons. But it also shed light on a problem facing cyclists in many cities making half-hearted attempts at accommodating cyclists. 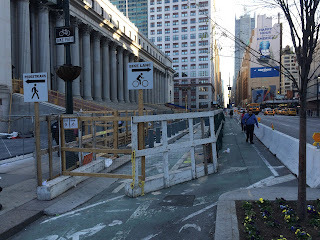 I was struck, as I rode on, by how cycling had been shoe-horned into New York City in a way that’s meant to avoid inconveniencing anyone else. No-one had ever told this woman that, yes, she might occasionally have to wait a few seconds to get past a cyclist. The builders (more accurately, painters) of the 9th St bike lane had sought to make it barely impinge on drivers. The designs betray a profound confusion in public policy. There’s a vague instinct that cyclists can’t be entirely denied better facilities. But that goes hand in hand with cowardice about the idea that promoting cycling is a public good. There’s no sense that sacrifices to encourage cycling might be worth everybody’s while. The unspoken sense is that cyclists should take up no space, have no momentum and cause no-one else to modify any part of their behaviour. The inevitable result is that cyclists are forced into making the compromises that others get to avoid. As I rode down 8th St, I faced a choice between being harassed for riding down the middle of the street or taking the risk of being hit by an inattentive driver’s opening door and knocked into the path of a driver passing me at 30mph. Had I chosen instead to ride down 9th St, I’d have faced a combination of both dangers. I’d have had to ride in the parked cars’ door zone then pull out round the parked vehicles, being tailgated by drivers who thought I should somehow not be out of the bike lane. It’s no surprise under these circumstances that cycling in New York remains a fringe activity, confined to a relative handful of us who think the personal benefits of getting about by bike outweigh the costs. It’s a situation mirrored in the many cities across North America and some parts of Europe. The current circumstances practically guarantee that the benefits the planners were seeking from cycling – cleaner air, safer streets, better use of road space – won’t materialise. The dominant surviving forms of cycling – fast riding by the young and fit, coupled with widespread rule-breaking by riders fleeing dangerous drivers – are used as evidence that promoting cycling is a Bad Thing. It’s time for such cities either to get serious about cycling provision or to stop the current dangerous and stressful pretence. Not, I’m sure, that any of this would make sense from the perspective of the Angry BMW Driver of 8th St. It must, I accept, seem odd when driving a large vehicle down a street to see a cyclist, a single person on a narrow vehicle, taking up the centre of the lane. It must, in certain circumstances, feel like a theft of the road space. I don’t ride down the middle of the road to make some abstruse point, however. As I use these streets, my bike computer often tells me I’m going well over 20mph. As a large man on a heavy bike with luggage, I have significant momentum. If a driver opened a door into my path or pulled out of a parking space without looking, I would be sent flying over my handlebars. These aren’t marginal, theoretical risks. Only a few weeks ago on 8th St, I had to swerve at high speed after a driver pulled out, fast, from a parking space into my path. Had I been riding where the Angry Woman thought I should, I could easily have been killed. Nor was I in any real sense inconveniencing the woman. 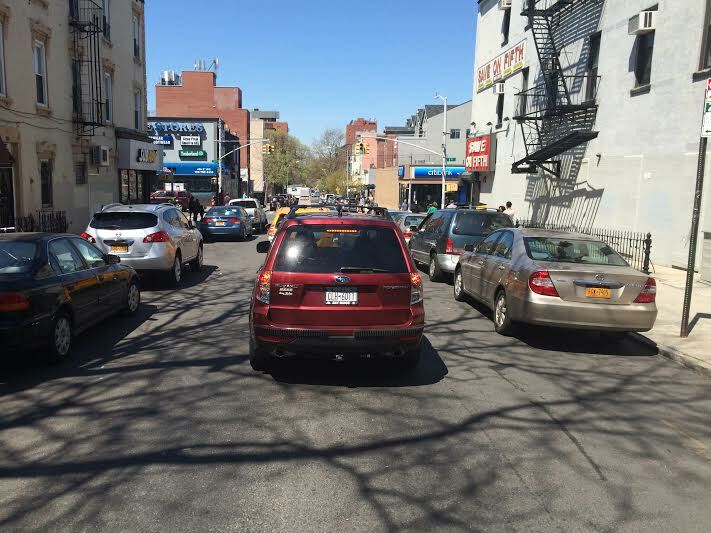 Like other narrow Park Slope streets, 8th Street is regularly clogged by double-parkers. The next block downhill features two speed bumps, which I can take without slowing down and drivers can’t. The woman’s inability to pass me was clearly, however, an affront to her sense of her rights. 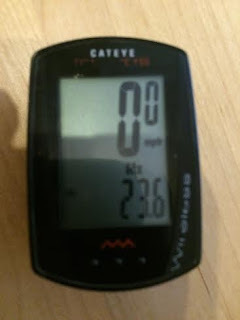 Her lack of human sympathy for me as a fellow road-user seemed to have bled over into a wider resentment at my having any physical presence at all. It’s a feeling I encounter surprisingly frequently, from both drivers and pedestrians. 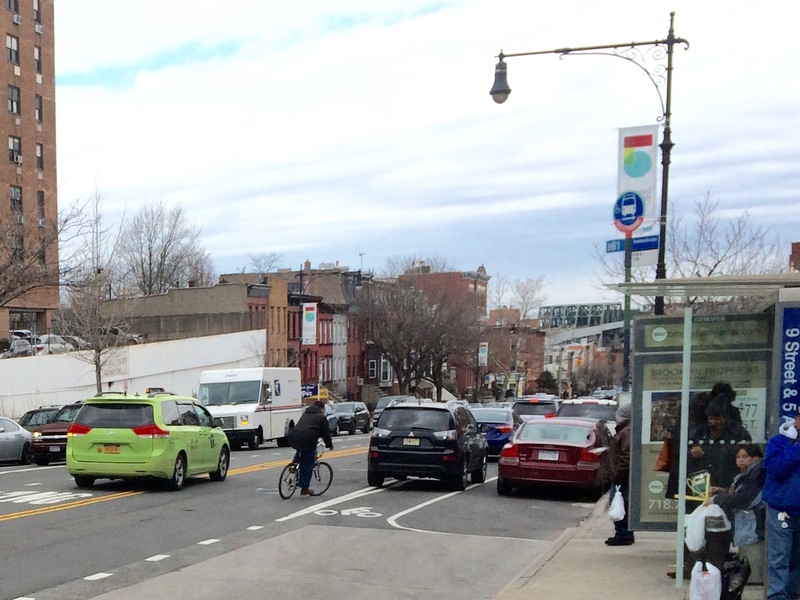 I’ve recounted before a run-in with a pedestrian who insisted on obstructing the Grand St bike lane in Manhattan. 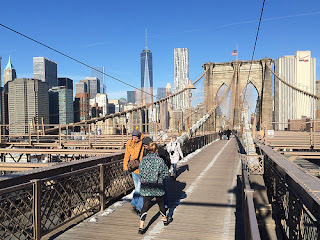 The Saturday before my dispute with the angry woman on 8th Street, I was yelled at by a tourist who insisted that, because he wanted to walk on the Brooklyn Bridge’s bike lane, I too should walk, not ride, over the bridge. I’ve come to understand taxi drivers’ tendency to pull out of parking places into my path as more a mark of their sense that cyclists can and should yield to them at will, more than a mere symptom of inattention. one recent critic told me no cyclist should expect to use. The misunderstanding extends to those meant to enforce New York’s traffic rules. There has been understandable outrage after it emerged that a right-turning police officer knocked a cyclist off his bike on 9th St in Gowanus, very near my apartment, then had a fellow-officer write that his turn had been perfectly legal. My sense is that the incident might partly reflect police officers’ genuine conviction that it’s a cyclist’s job to avoid traffic turning across his or her path, not a driver’s job to yield. I used to encounter similar attitudes when I cycled in London – and I can’t imagine they’ll have disappeared entirely when I return there later this year. But London has at least started groping towards an answer to the kinds of incidents I keep encountering. After the disaster of the initial, blue-painted Cycle Superhighways, Transport for London has finally been shamed into providing some decent, segregated cycle paths on some of its busiest streets. Even when I lived there, London was already far better than New York at providing calming on side streets like 8th St to avoid incidents like the one I suffered on Saturday. There’s tragically no sign at all that anyone in New York feels under pressure to provide anything like that on this side of the Atlantic. Yet New York’s continuing state of cycling limbo isn’t a merely theoretical problem. Cyclists truly can’t screech instantly to a halt of float harmlessly away from vehicles that menace them. The day before my row with the Angry Driver, a driver a couple of miles away had killed a cyclist riding to work in Clinton Hill. This morning, a huge truck, driving on a street where it wasn’t permitted, killed a man on his bike in Park Slope only 15 blocks or so from where I had my row. The police’s instinct in both cases was immediately to blame the cyclists, essentially, for being where they were. They claimed – improbably, given what is known about her – that Lauren Davis, the victim in Clinton Hill, had been riding against traffic. They have focused, still more improbably, in the Park Slope crash on the theory that James Gregg, the victim, was hanging onto the truck that killed him to hitch a ride. I have never seen a cyclist in New York City do such a thing. The instinct to exonerate the truck driver is all the more extraordinary given that it is clear he was breaking the law just by driving down that street. Both victims seem to me to have died from the grubby compromises forced on cyclists by cowardly road designers and politicians. I am fortunate indeed that I have so far derived only physical benefits and no serious harm from my New York cycling. Yet, just hours after the Park Slope tragedy, I encountered the kind of contemptuous attitude that makes such tragedies all too common. Riding through Fort Greene and needing to turn left, I looked over my shoulder to see the driver in the next lane absorbed in his phone, rather than his driving. Fearful that he wouldn’t spot me as I pulled across, I rode for a second or two staring at him while signalling. That turned out to be an indignity too far. He sped up for a second or two, to block my turn. Then, when I’d successfully pulled left and turned out of his way, he yelled abuse. He was furious that I’d made him momentarily take his mind off his text.